Haflinger stallions take the first letter of the sire's name. Haflinger mares take the first letter of the dam's name. Mulan-1993 flaxen chestnut. Sired by Nissan (r), out of Monja (r). 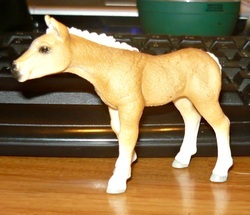 Same model as the mare below, I have three of them now. Will get a different pic of it at some point. Cadmiun-1994 flaxen chestnut. Sired by Winterstar (r), out of Cenzi (r). 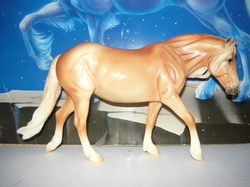 Dragon-1996 flaxen chestnut. Sired by Adanac (r), out of Donia (r). 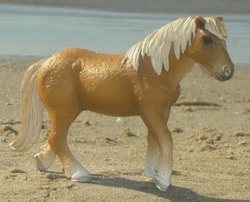 Mochafrappie-1998 flaxen chestnut. Sired by Nimbus, out of Mulan. Temp pic for now. My laptop decided to eat my beach pic of her. 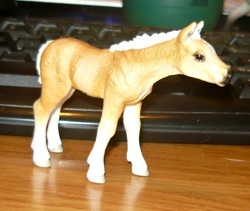 2008-Marzia, flaxen chestnut filly (x Windstorm) o/b Oak Tree Equestrian Stud. 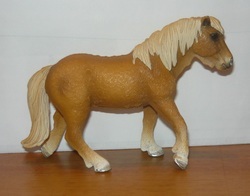 Lithium-1999 flaxen chestnut. Sired by Alpruf (r), out of Lisa (r). 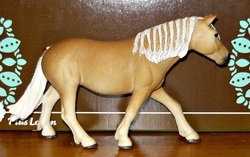 Waria-2001 flaxen chestnut. Sired by Aachen (r), out of Wanessa (r). Will get a better pic later. I have three of these same models. Magma-2001 flaxen chestnut. Sired by Admont (r), out of Milana (r).